And when you finally reach it – kindly hauled in the caretaker’s rundown pickup truck on the suffocating summer day from one end of the cemetery, where you thought she might be, to the other end, where she is – you stand there, next to a stranger. "They still don’t want to claim her, do they," he comments wryly, reflecting on the complete lack of any directions to the grave of one of the 20th century’s most revered and intensely discussed writers, laid ot rest here 35 years ago last August. You nod in agreement and wonder who placed the broken plastic olive-colored Madonna above the name on the flat marble slab. And if you are finally conscious now of your place in the O’Connor universe, you will know to brace yourself; for any moment, grace may strike –and, no question, it will hurt. “I write the way I do because (not though) I am a Catholic. This is a fact, and nothing covers it like the bald statement. 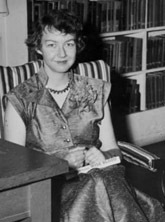 Flannery O’Connor, an only child, was born in Savannah and educated in Catholic schools there. The family moved to her mother’s family home of Milledgeville when O’Connor was 12 and after her father died, at the age of 44, of lupus. O’ Connor attended Georgia State College for Women (now Georgia College and State University) and then the Iowa Writer’s Workshop, from which she received her master’s degree in fine arts in 1947. Her writing was clearly superior – fellow writers at Iowa recall workshop sessions, usually sites of unrepentant critical blood-letting, falling silent after Flannery’s stories were read. Her first novel, Wise Blood, was published in 1952. Her intentions to lead the writing life up North were cut short when she was diagnosed with lupus herself at the age of 26. She returned to Milledgeville to live with her mother on Andalusia, their farm just north of town. She spent the next 13 years writing, receiving visitors, occasionally venturing forth to give lectures, raising peacocks, painting, and suffering gracefully from the ravages her disease, a pain that rarely, if ever, found its way into the hundreds of witty and profound letters she wrote during those years. She died on August 3, 1964. So what will you find when you read Flannery O’Connor? What will probably strike you first is the riot of characters – rural Southerners, incisively drawn with precision and an uncanny comic sense: the self-satisfied “good woman” thanking God He didn’t make her either black or white trash, the clueless intellectuals out to lay ignorance bare, traveling salesmen and con artists, preachers, prophets and children filled with ancient wisdom. Her stories, situated in the specific spot of the mid-20th century rural “Christ-haunted” South, dramatize what she accepted as universal truth: that the world has, “for all its horror, been found by God to be worth dying for,” and this world broken by sin is fighting that same redemption literally to the death. ”Everybody who has read Wise Blood thinks I’m a hillbilly nihilist, whereas I would like to create the impression….that I’m a hillbilly Thomist,” she wrote in a letter in 1955. O’Connor was deeply conversant in Catholic theology – a glance at her library, on display in the Flannery O’Connor Room at Georgia State College, reveals works by Thomas Aquinas, St. Augustine, Jacque Maritain, Leon Bloy, Ronald Knox, St. John of the Cross, and Baron von Hugel, among others. So, you are wondering now, what is going on in these stories? Robert Coles answered the question well when we wrote of O’Connor, “She is stalking pride.” For Flannery O’Connor, faith means essentially seeing the world as it is, which means through the Creator’s eyes. So lack of faith is a kind of blindness, and what brings on the refusal to embrace God’s vision – faith—is nothing but pride. primarily their ignorant parents, aright; social workers who neglect their own children; self-satisfied unthinking “good people” who rest easily in their own arrogance; the fiercely independent who will not submit their wills to God or anyone else if it kills them. And sometimes, it does. So take a chance, and take a look at Flannery O’Connor. Prepare to laugh, to be shocked, and to think. But most of all, be prepared to see.